Missionaries were active explorers as they searched for new souls to convert. This engraving shows four Anglican missionaries from the Bay of Islands on a journey to Matamata in 1833. The European to the left is the leader of the group, Henry Williams. John Morgan (right) is being helped out of a hole by Māori porters. The two men in the centre are Alfred Nesbit Brown and William Fairburn. 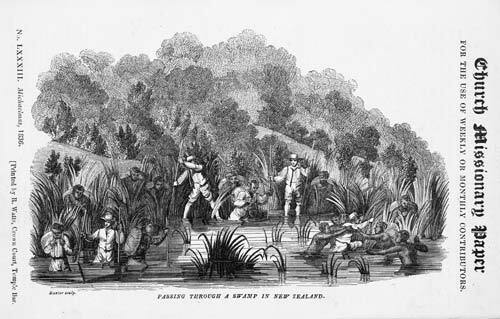 The engraving was published in a quarterly paper of the Church Missionary Society in 1836, and was based on a sketch by Henry Williams.